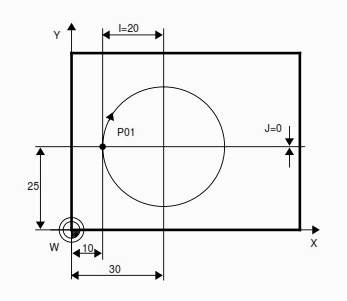 How to mill a full circle, no problem below is the cnc program example G-code which shows how to program a full circle on a cnc milling machine. Often cnc machinists has to complete such components which require a full circle machining sometimes inside full circle sometimes you have to program an outside full circle. This G-code example will show you how to program a full circle from out-side. N05 Tool rapid traverse (G00) to point P01. N15 X-Y plane selected automatically (G17). Tool travels clockwise around a full circle (G02). N20/N25 Rapid traverse (G00) retraction. N30 End of program (M30). If you want a clock-wise circle you will use G02 as shown in this program. but if you want a counter-clock-wise circle then use G03 G-code. I – Distance from circle start-point to circle-center-point in X-axis. to show how to measure I and J the values of I and J are separately given in the above figure.